The number I want you to remember today is 38. It’s the number of slots on an American roulette wheel (0, 00, and 1 through 36). It’s the atomic number of strontium. Colorado was the 38th state to be admitted to the Union. And it’s the current Guinness World Record for the most fish caught with one hand in one minute (set in 2005 by Mirko Dhem and Nils Graulich with salmon). The number 38 is also significant for word-of-mouth. Over the last few weeks, you’ve heard me talk about word-of-mouth marketing and its importance for business growth. As I’ve said, word-of-mouth isn’t created equally, and it is not distributed evenly. Restaurants, in particular, are word-of-mouth hot zones. Here’s where the number 38 makes its entrance: I talked to hundreds of customers who’ve eaten at a Cheesecake Factory, and 38% of them have told someone else—without being asked—about the size of the menu. The menu is so enormous, it’s ginormous. It is 5,940 words long, which itself is a focal point and causes much discussion by customers. That way existing customers recruit more customers for the Cheesecake Factory. We call this a talk trigger, but I’ll get to that in a minute. In our 2018 proprietary word-of-mouth report, Chatter Matters, we found that when choosing a restaurant, half of Americans rely on recommendations from friends and family. When it comes to restaurants, offline referrals are more persuasive than online referrals. Remember, word of mouth isn’t distributed evenly, even when it comes to audience segments within the same industry. As you can imagine, younger Americans rely heavily on online word-of-mouth like social media and rating websites. When choosing a restaurant, Gen Z and Millennials are 99% more likely to rely on social media and online reviews than Gen X and Boomers. In our new book, Talk Triggers: The Complete Guide to Creating Customers with Word of Mouth, Daniel Lemin and I talk about several examples of effective word-of-mouth strategies used by restaurants. 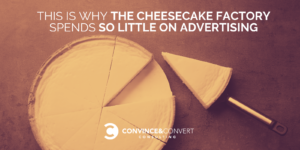 As a result of its talk-trigger menu, the Cheesecake Factory has spent very little on advertising and is an example of how to have your customers grow your business for you. Skip’s Kitchen is a one-location restaurant in Sacramento, run by a guy named Skip. The restaurant is counter service, and its menu consists of mostly high-end burgers. Customers go to the counter and order. Once they’ve ordered, whether it’s a one-person or 12-person party, the person behind the counter fans out a deck of cards and says, “pick a card.” If the customer picks a joker, the entire meal is free. On average, this happens three times a day, and people go bonkers for it. If a joker is pulled, a bell is sounded, selfies are taken, and customers tell their friends about Skip’s. Skip’s has spent zero dollars on marketing in seven years. Their joker talk trigger is the only thing they do, and—most of the time—there’s a line to dine at Skip’s. The D.C.-based fast-food restaurant Five Guys has nearly 1,500 restaurants globally with more on the way. Five Guys is known for its basic but solid menu, quality food and commitment to consistency. It’s also known for its french fries. You can order fries in one of two ways: salted or Cajun, and both styles have a reputation for being tasty, but tasty fries alone don’t qualify as a talk trigger. Getting a heap of bonus fries does. Every time you order fries at Five Guys, they give you extra, and I mean A LOT of extra fries. A small order looks like a large, and a large order is enough to feed a junior high classroom. This act, the act of giving customers a mountain of extra fries, has become something Five Guys is known for, and its customers make sure to mention it. Whether it’s the restaurant industry where word-of-mouth rules or B2B, any business can have a talk trigger and motivate customers to do the talking for it. Download the complete Chatter Matters report, the most recent word of mouth research available to marketers. Talk Triggers was released on October 3 and is available on Amazon. Chatter Matters is a proprietary word-of-mouth report produced by Convince & Convert Consulting and the research firm, Audience Audit. It examines the word-of-mouth attitudes of 1,001 randomly selected Americans. The margin of error is approximately +/- 3.1%. Chatter Matters is a companion piece to the new book, Talk Triggers: The Complete Guide to Creating Customers with Word-of-Mouth. Talk Triggers was co-authored by Jay Baer and Daniel Lemin.